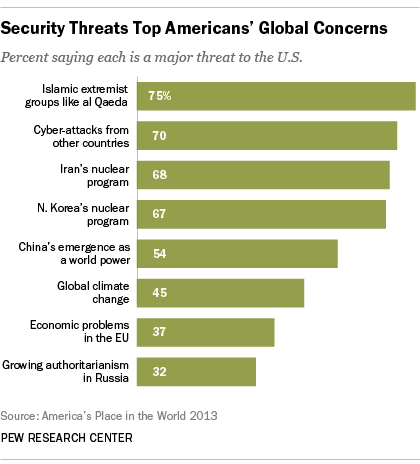 While Americans say they want the U.S. to mind its own business and focus on issues at home, they remain concerned about the international security threats that face the nation in 2014, according to a recent survey by the Pew Research Center. The public is significantly less concerned about long-term global environmental and economic difficulties, and issues that do not appear to pose a direct danger to the U.S. The legacy of the 2001 attack on the World Trade Center and subsequent terrorist incidents at home and abroad still cast a long shadow over many Americans. The survey, conducted Oct. 30-Nov. 6, found that 75% of Americans said that extremist groups like al Qaeda pose a major threat to the U.S. That level of concern was virtually unchanged since 2009. The public is also deeply concerned by a newly-emerging security challenge: possible cyber-attacks against the U.S. Seven-in-ten say that cyber-warfare represents a major threat to the country. Recent Obama administration efforts to defuse the nuclear stand-off with Iran, which led to an agreement in late November freezing parts of Iran’s nuclear program, came at a time when it was a major concern for Americans. Nearly seven-in-ten Americans (68%) in the survey, which was conducted before the agreement was reached, said that Iran’s nuclear program was a major threat to the well-being of the U.S., a sentiment that changed only modestly from surveys in 2009 and 2005. About two-thirds (67%) of Americans were also very concerned about North Korea’s nuclear program. Despite the superpower competition between the U.S. and China, just over half the public (54%) see China’s emergence as a world power as a major threat. Other challenges arouse less concern. Almost a third of the public see growing authoritarianism in Russia as a major threat. The long-running European economic crisis seems to have stabilized for the moment, resulting in less than four-in-ten Americans seeing it as a danger. Climate change evokes little American concern. Less than half the public says it is a threat to the country.